Recently, COTN was gifted with a 10-acre parcel of property in the village of Chirombo in Malawi. Chirombo, a village of 1,000+ is the newest community added to our Village Partnership Program in Malawi. At our first open enrollment, 375 children were enrolled in our program, though many more children live in this village and the surrounding communities. According to Yobbe Lungu, COTN–MA Country Director, “We have plans to build a partnership center and possibly a skills center for the orphan and destitute children in the community.” Join us in praying for God’s transformation in this village. 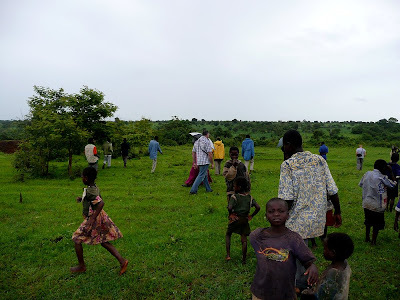 This photo was taken while our COTN Malawi staff were praying over the borders of our new Chirombo property in Malawi.